Installing SASS on windows / Linux (Ubuntu) and generating CSS file using Compass’s command compass watch is an easy way to design websites. For this we have to install Ruby and its gem(like plugins) called compass but if you want to play with bootstrap then have to install gem bootstrap-sass. We can Install for windows, Mac and if you want then also Linux too, But in this tutorial I am going to show you on only windows and on ubuntu based distros(prefer latest version). First we have to install Ruby. 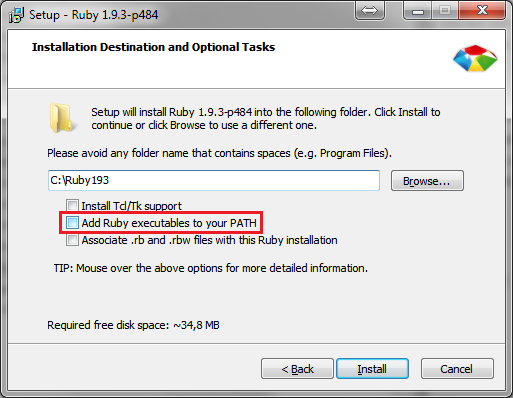 visit http://rubyinstaller.org/ download stable version like 1.93 or 2.x . First Command (gem update –system) will check if there any update available for installing games. Installing Ruby,Bootstrap, SASS and compass is easy on ubuntu based distros. Just couple of commands and everything install. First Check ruby installed or not ?